I recently read that an a/v-centric distro of Ubuntu had been released. It was the latest version (Feisty Fawn) of Ubuntu packaged with a whole battery of audio, video, and graphics software. I've been a long time user of Apple and Macrodobe software to perform these tasks, but I wanted to see what an environment containing the best open source versions of that functionality would be like. I installed Ubuntu under Parallels on my MacBook Pro, which was not all that easy. I had read that (just for the actual installation) you needed to tell Parallels that you were installing a Solaris/Other Solaris operating system. Once that was done, the installation process was fairly straightforward. It all felt very Windows NT (big, blue screens with red progress bars, etc.) which gave me a sort of geek nostalgia. Once the installation was complete, I switched the VM back to Linux Kernel 2.6 and was ready to go, or so I thought. Turns out that the amount of memory allocated can't be any greater than 512 MB (At least until the guest OS is installed). The result was that the boot would freeze at some point each time I started the VM. Once I set that correctly, Ubuntu launched and I was able to log in. I was impressed with how mature the look of the interface was, but just as disappointed with the lack of maturity in the feel of interacting with the environment. While the interface is very shiny (aqua/vista-esque), windows and dialogs pop open in a way that recalls Windows 3.1. Maybe I've become spoiled by the fade-y, zoom-y, alpha-channel-all-to-hell operating systems coming out of Cupertino and Redmond, but there's something to be said for an interactive environment that doesn't make mouse clicks feel like switch flips. However, I do think this is simply a matter of maturity and will be addressed in future distros. Once I got into the applications, I was pleased with how powerful the applications were (especially given the price tag). 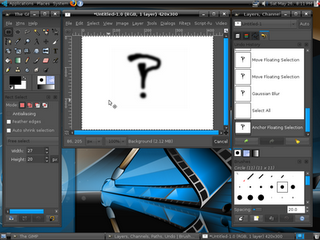 Some of the applications were small and focused (like Agave, a color scheme chooser), and some were full blown design applications (like Gimp). I will follow with some posts on my experience with other applications as I use them. One major item yet to be addressed is inter-application integration. Even before Adobe gobbled up Macromedia, there existed a high degree of integration between applications like Photoshop and Flash. Currently, any integration I see in Ubuntu is handled through the file system (Save As in one app and Open in another). Again, I think these issues will be addressed as the environment matures.